This is a really tasty salad, and is absolutely perfect for the warm weather at the moment. It is also keeps well for leftovers or to take to work the following day. Definitely a nice, easy recipe to mix up your dinner repertoire with a really delicious combination of flavours and textures. 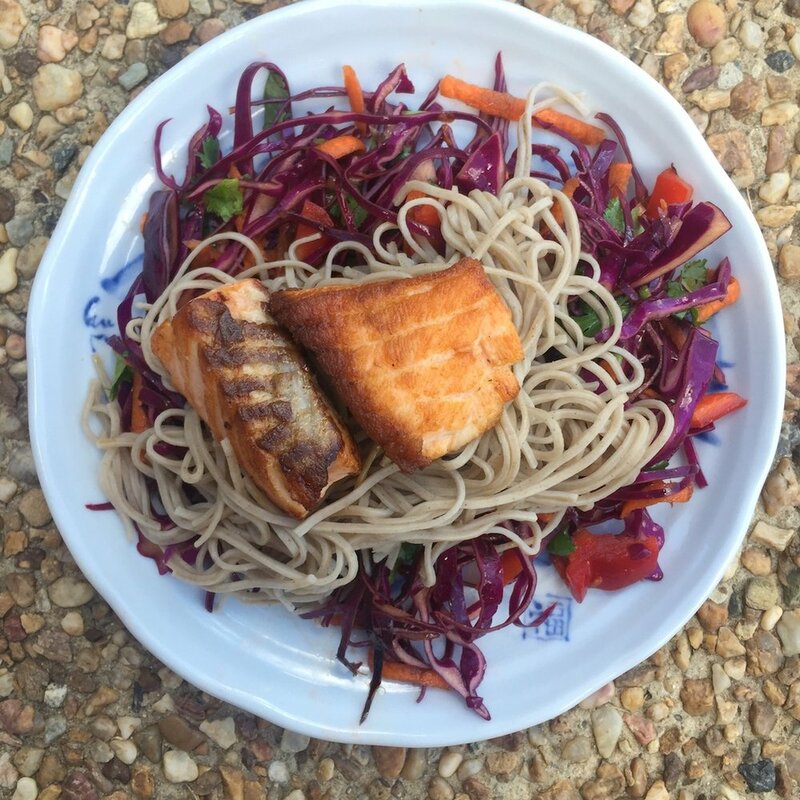 This recipe contains plenty of vegetables which are star players in supporting overall good health; soba noodles, which are delicious and a nice change from regular pasta; and salmon, a rich source of omega 3 fatty acids, which help to reduce triglycerides (an unhealthy fat in the body) and contribute to heart health. 1. Put a large pot of water on the heat to boil (for the soba noodles). 2. Add all of the finely sliced and grated vegetables in a large bowl, as per the below photo, and mix to combine. 3. Heat a frypan (or you could use a barbecue) on medium to high heat, when hot add a small amount of olive oil then add the salmon to the pan. Cook for 6-8 minutes each side or until lightly crispy and brown. Remove from heat. 4. When the pot of water is boiling, cook the soba noodles as per the packet instructions. Drain the noodles when they are ready. 5. Mix the salad dressing ingredients together, then use half the dressing to dress the large bowl of salad. 6. To serve place a large scoop of salad, soba noodles, and a piece of salmon (or two if they are small) in each bowl, and spoon dressing over the top. Enjoy!